Drive. 1 spiked wheel, by chain. Engine. 2 – 3 cv 2 stroke (2 temps) moteur. Engine/moteur size not known but between 100 – 150 cm3 motobecane. Width. With a working width of 30 cms. Implements. 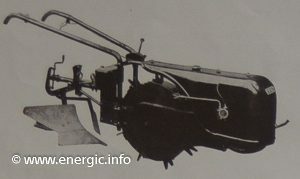 Mono soc plough, hoes, etc. Available from 1934 to 1939.To my records very few where produced, in fact in 1935 and before there is a record of 6 only. Read more about the Energic motoculteur C7 B4L here. Read more about the Energic motoculteur D9 B5L here.